Here's a mysterious CD. 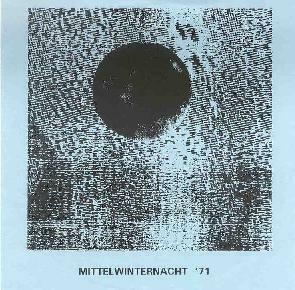 The only credits on Mittelwinternacht � say, "played and produced by Edward Fraser and Christopher French, 21-22 Dec 1971". Hmmmmm.... is this some lost kosmiche classic or someone's idea of a joke? Well there's no joke about the music itself, which pays homage to pioneers like Tangerine Dream. And I mean the earliest stuff. The album includes 4 tracks, 3 of which stretch out and explore for well over the 10 minute mark, of screaming noise-space textures that sail across an otherworldly landscape, pushed to high levels of intensity by pulsating drones, and haunting waves of cosmic sound. This isn't just mere floating electronica either... no sir. This is busy stuff that is developing continually and with a clear but freeform sense of direction. At least that's the sense I had as I chilled out under the headphones. There's lots of interesting mood changes too, as we transition from high volume atmospherics that sound like Walpurgis Night in space to calmer sections that would be almost meditative if they weren't so damn intense. For example, much of the track "Die Pulsar Kommt" consists of peaceful drifting waves. But the rapidly warbling patterns and heart thumping drones keep the listener at bug eyed attention throughout. Yup, there's lots of treasures to be mined here that stand up to repeated listens. So if you pine away for the old days of ultra kosmiche space excursions that let you know exactly how astronauts feel looking out into heavens... then this is a must have. For more information you can email mriclough@aol.com.